Chocolate Persimmon Trifle is a unique dessert creation, inspired by my friend Carole's suggestion that I should try using Hachiya persimmons (the soft variety) in puddings and custards. I love Hachiya persimmons and I usually eat them as is, but I'm always up for a challenge. At first, I wanted to play it safe and make a persimmon almondine tart but that would have been too easy. So I made a trifle with layers of basic white cake, persimmon pudding and chocolate. 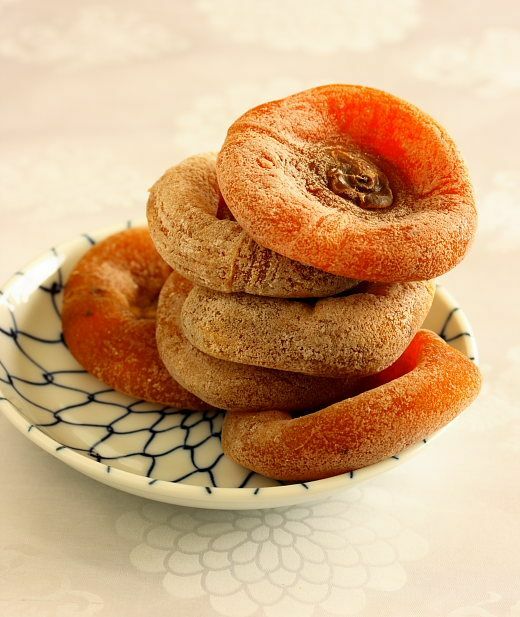 I usually cook with Fuyu persimmons (the hard variety) but after this decadent dessert, I'm definitely going to test out more recipes using the Hachiya variety. Beat the 3 egg yolks with 2 tablespoons of superfine sugar in a small stainless steel mixing bowl. Prepare a double boiler: Fill a saucepan with water, making sure the water barely covers the bottom of the stainless steel mixing bowl. I always like to add a little kitchen towel on top of the pan, under the bowl so there won't be any splatter of water in your egg mixture. Bring the water to a boil then lower the heat to a gentle simmer. Place the stainless steel bowl on the saucepan and start whisking the egg mixture vigorously for about 3-5 minutes using a handheld mixer. You'll get a pale, yellow foam and the texture of the egg yolk will be thicker. The mixture should fall like a ribbon of sauce when you lift the whisk. In another mixing bowl, whisk the mascarpone cheese to soften it. Slowly add the egg mixture to the mascarpone, adding just a little egg at a time. Add the vanilla extract and salt. Divide the filling into 2 bowls. In one bowl, add the persimmon pulp, dried persimmon bits and cinnamon extract. Heat a pot half-full of water to a gentle simmer, cover it with a piece of cloth so the bowl does not move and place a stainless-steel bowl filled with chopped milk chocolate on top. When the chocolate is melted, let the chocolate cool for about 2-3 minutes and add it to the second bowl of mascarpone. Add a tablespoon of rum. Clean your handheld mixer in hot soapy water. Always make sure the beater blades are completely clean prior to whipping cream or egg whites for optimum results. 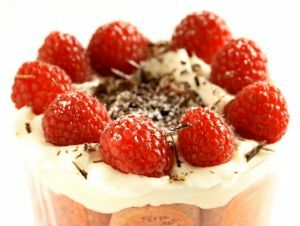 Whisk the 2 cups of cold whipping cream until it forms soft peaks. Add 3 tablespoons of powdered sugar. Divide the cream in half. Using a silicone spatula, gently fold half the whipped cream into both mascarpone mixtures to get an airy batter. 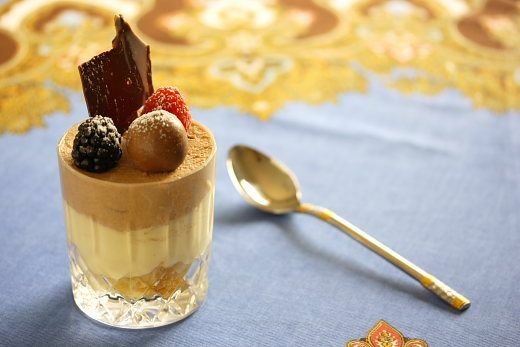 How you assemble the dessert is up to you. The girls and I were debating on how to present these dessert cups. We used 7-¾-ounce whiskey glasses but in the end, I found that the container was a little large for one serving. I would say, pick a container depending on the appetite of your guests. Using a circle cutter, create 16 (3-inch diameter) rounds of white cake. Place a round of white cake in each cup. Drizzle with a little rum. Spoon a layer of persimmon pudding. Stack another layer of white cake, drizzle a little rum and complete with the chocolate layer. Even out the top using a spreader. Repeat the same procedure for the rest of the cups. Plastic-wrap the containers and chill in the refrigerator for at least 4 hours. When you're ready to serve, unwrap the cup, decorate with berries or dried fruits, a milk chocolate truffle, (I used Lindt chocolate), a thin homemade milk and white chocolate piece (I'll post how to make them soon) or a gavotte milk chocolate crepe dentelle cookie and sprinkle with powdered sugar. 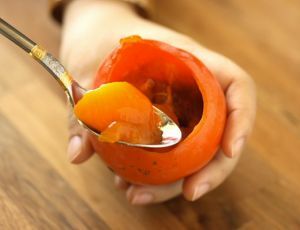 Persimmon pulp is obtained by gathering the pulp from ripe Hachiya persimmons. Pulse the pulp in a food processor to make sure it's smooth and string-less. A lot of Asian stores in the Bay Area carry superb dried persimmons this season. They're sold in 1-pound packages (6 dried persimmons per pound). They are incredibly sweet, still moist , full of fiber and delicious. 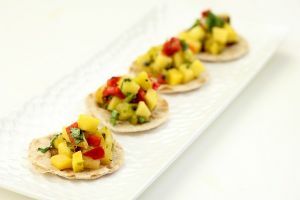 They're a great, healthy snack and are a refreshing alternative to more commonly found dried fruits such as dates, prunes, raisins and dried apricots. I baked a white cake on a (13 x 18-inch) jelly roll pan. The recipe is pretty basic; the usual ingredients are necessary: flour, baking powder, butter, sugar, milk, vanilla and egg whites. Bake at 350°F for 35-40 minutes. I prefer using superfine sugar. It's fine-grained and dissolves more quickly than regular granulated sugar. I find it best to store the trifles for at least 4 hours so the white cake has time to soak up all the flavors of the rum, persimmon and chocolate blend. 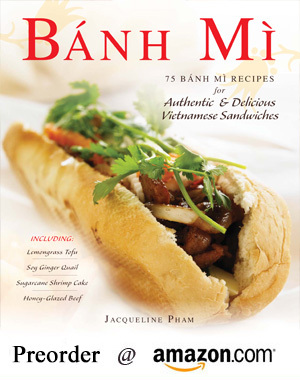 Published By: Jacqueline Pham on January 20, 2010. 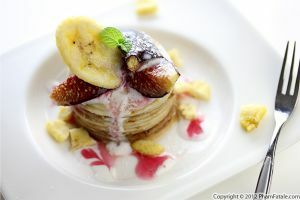 I love mascarpone fillings! I don't know much about persimmons though - what's the difference between the Hachiya and Fuyu varieties? Though they are both persimmons, the varieties are extremely different. Fuyu have a hard and crunchy texture. Similar to an apple, but less mealy - maybe more like a nectarine. They are sweet but mild. 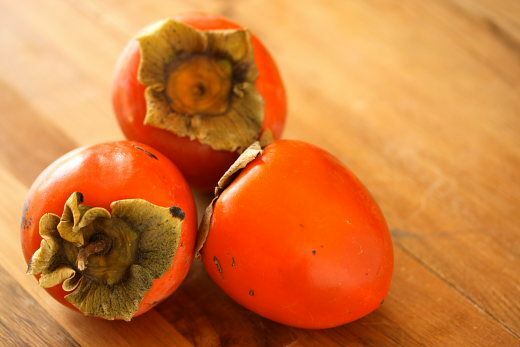 Hachiya persimmons, when completely ripe, have the consistency of jelly. The flavor is really complex and delicious. The trick though is waiting till they are completely ripe, because otherwise they are highly astringent and will give you cotton-mouth. I've written posts on both varieties. You can find the links in the related posts section. Oh how lovely! I don't think I've seen persimmons regularly for sale in the UK. That looks fabulous! 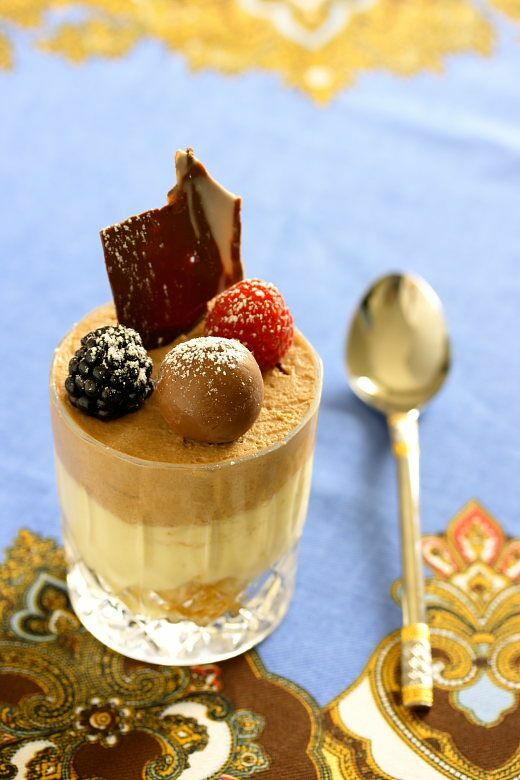 Your trifle looks perfect! Nicely done! Oh my gosh! This belongs in an art museum. It is breathtaking. 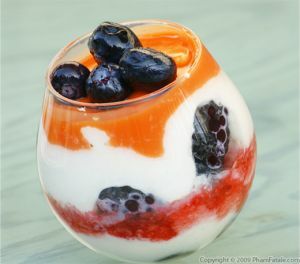 If you made this for me, I might just be convinced to try persimmons! Nice work. I like the mascarpone fillings. can't wait to try it.